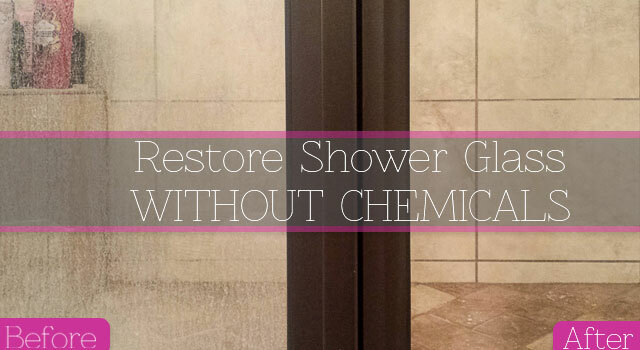 Tired of the hard water stains covering our glass shower doors, we finally figured out how to get them clean in an afternoon with no chemicals! Let’s just mark this down as my most embarrassing post to date. 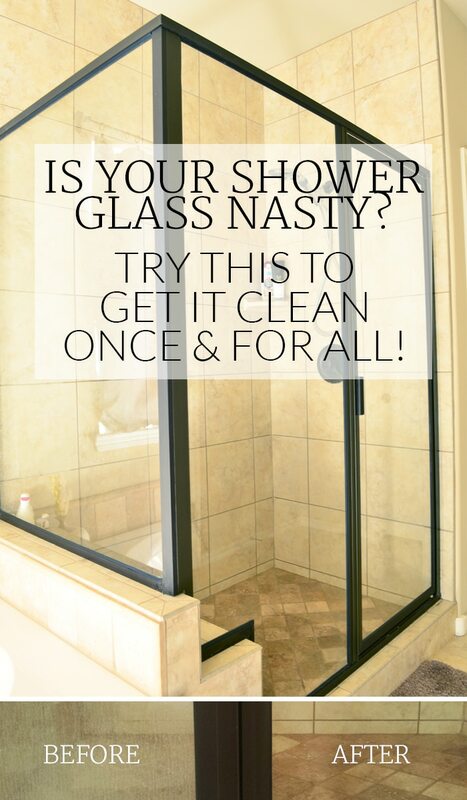 I’m going to show you our nasty shower glass that I COULD NOT get clean, no matter what I tried. We’re talking homemade cleaners, chemicals, magic erasers, and brute force with scrubby sponges. Nothing was making the glass clear again. Hard water is MEAN stuff. But I finally found a way to clean shower doors! I thought we were just going to have to claim that it was frosted glass until we could pay the big bucks to replace it. Then I remembered that HomeRight, my favorite brand for painting tools, also makes a SteamMachine. I reached out to them to find out if anyone had ever used it on shower glass for serious hard water stains. They offered to send me one to test out and said they’d even sponsor a giveaway if it worked. Lucky for all of us, it DID work. I’ll show you my results and then you’ll find the giveaway at the end (giveaway ended). Although I am absolutely claiming the SteamMachine as my new best friend, it is NOT as easy as waving the steaming wand and having a beautiful shower. The process still takes some hard work and time, but the cost savings over replacing the glass make it 100% worth the effort! The SteamMachine comes with tons of attachments for everything from cleaning the oven to removing wallpaper. I tried out a few different options before landing on the best system for cleaning the shower glass. You’ll also need a jug of distilled water and a spray bottle of white vinegar. 1. Fill SteamMachine with DISTILLED WATER and let it preheat per instructions. 2. In your first section, spray the glass with vinegar, letting it soak around 2 minutes. on your SteamMachine, scrub the glass from top to bottom while steaming. 4. Spray with vinegar again. 5. Use the squeegee attachment on the SteamMachine SLOWLY from top to bottom. You’ll probably need to re-squeegee a few areas without steam so you end up with a dry door. 6. Evaluate your dry door and repeat steps as necessary! It’s so crazy to be able to see all the way through the doors! I was on a roll with the glass, so my husband wanted to try it on the tile too. The small nylon brush is perfect for grout. It also worked on the nasty hard water infested track at the bottom of the door. And notice that you can’t even see the tile through the glass in this before pic. It isn’t perfect after, but it’s SO much better! I need to work a little more on the last few spots. They aren’t nearly as noticeable in real life, but now that I have this zoomed in picture, I feel the need to attack them 🙂 Check out the glass – you can see the shower floor! The floor isn’t dirty by the way, the tiles are all different colors. Just in case you were wondering! Like I mentioned before, this transformation was not as simple as magically steaming years of hard water away. It took me a few hours to have this dramatic after. I gave myself AND the nylon scrubbing brushes a serious workout. It would also be a great idea to wear some kind of gloves. I didn’t, and the handle of the SteamMachine had my hand pretty raw after a couple hours of intense use. I didn’t really care because I was busy doing the clean glass happy dance, but the next day I realized I should have grabbed some gloves. I’ve got big plans for my little SteamMachine now. As soon as it’s warm enough, I’m going to use it to wash all the windows. Our tile floors, granite countertops, and glass cooktop are also on the list. It’s a good thing it’s fun or I’d be dreading that to do list! Update 1 : Over the past year, the steamer has been AMAZING for getting wrinkles out of curtains, duvets, and even clothing. To KEEP your shower glass from getting so bad now that it’s gorgeous again, pick up a suction cup squeegee. Then, get in the habit of quickly using it after every shower. We’ve been doing this in the year since I originally shared this post and it has made a HUGE difference. I think I’ve only cleaned the shower walls once since then, and they are still clear thanks to the new daily routine. The giveaway I mention up front is over, and a winner selected, but you can order the SteamMachine on Amazon. For more bathroom tips, check out all my ideas for 5-Minute Bathroom Organization! Thanks for sharing! 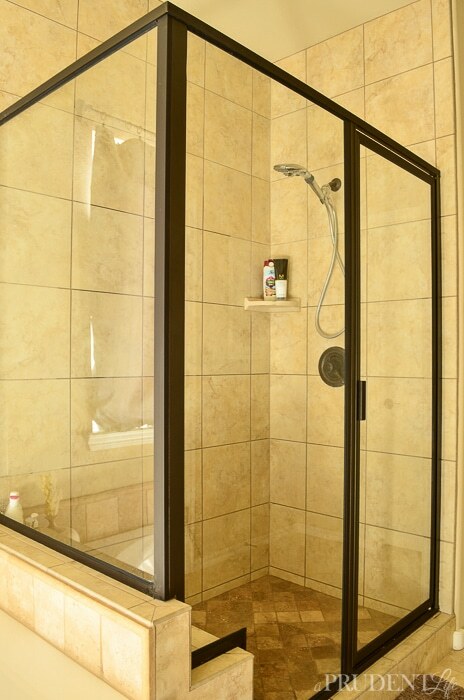 I’ve been looking for something to clean my shower doors with and I am glad that I came across this blog and post. I’ve tried a lot of home remedies that DID NOT work either. I hope to be “steamimg” soon. I’m so glad it worked for you too!!! Isn’t it bizarre to have clear doors again? I found a squeegee with a suction cup to keep in the shower, so our doors are still looking great. I won’t even attempt to enter the steam machine give-away, because I feel we’ve already won the lottery with the Waite Phillips biography! It is SO INTERESTING, and inspiring!!! Thank you again, SO MUCH!!!! You are an angel. 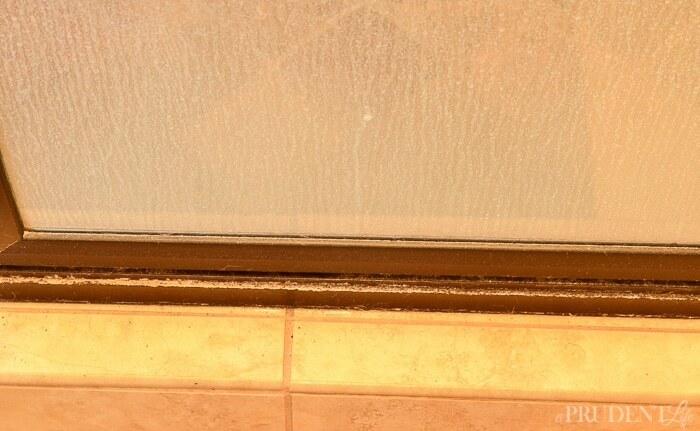 We do not have glass shower doors, but I have noticed in several friends’ homes that we have stayed in, they keep a larger squeegee thing-y to wipe the water down off the glass when your shower is over. 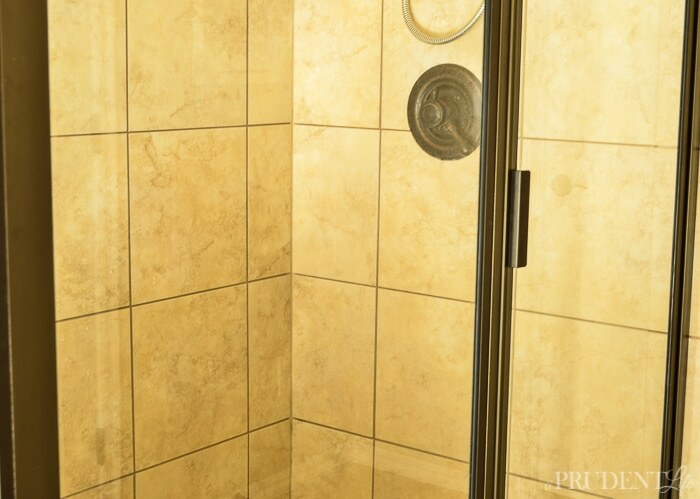 It only takes a few seconds while you are still in the shower stall, and it seems to work! I think there is also some product you can spray on the glass NOW while it is still sparkly-new and it repels water stains. If I can find out what that is, I will let you know!! You are so sweet Sarah! And yes – the squeegee thing is an awesome tip! Once upon a time when we moved into the house I had one in there…then we never used it which was a huge mistake! I need to buy a new one ASAP. We’ve actually been using the squeegee attachment from the SteamMachine this week until I get out to buy one. I found it!! Here it is…. Thank you!!!! I have a sample of a similar product called EnduroShield that I got at a blog conference last summer. After all my failed attempts at cleaning the glass back then, I finally had to give up on using my sample. Thanks for the reminder that I need to pull it out and use it!!! Vinegar is a chemical. It is a mixture of acetic acid and water. Dilute acetic acid is the chemical name for vinegar, and its chemical formula is CH3COOH. Those of us who want to keep away from harsher purchased chemicals need to find a way of saying it differently for those who opt for commercial chemicals look at us as weird and not educated, for everything we use is a chemical. I need to use my squeegee whenever I shower. Thanks for your feedback Rita! I went with the generally accepted lingo since that’s what the search engines like, but on a technical level I agree, vinegars (plus the water and air) are all chemicals. Rain X repels the water too, once the glass doors are throughly clean. I used it before and missed a few times which by my error the hard water stains reappeared. Again, I’m happy that I came across this blog! Thank you Wyndei! My husband and I actually had talked about trying that to see if it would work. I’m sure it’s more affordable than the specialty products. 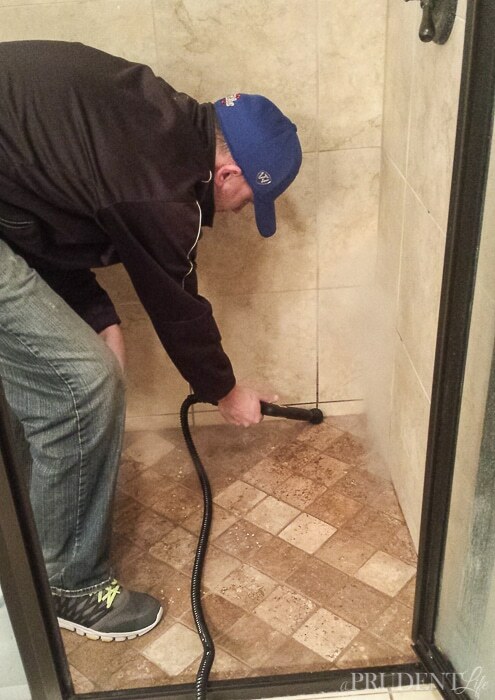 Yes, the Rain-X is perfect for shower doors and keeping the build up off of them! I’ve used it for years. You can also use it on the grout lines of your tile, but do not use it on the tile you stand on. Rain-X repels the water right off. Wow, what a difference! Same exact problem here. Tried everything, except for steam. The funny thing is that we got a glass shower door thinking it would be easier to keep clean than the builder grade plastic one. Thanks for sharing! I hope it works just as well for you! It’s a work out, but you won’t believe how great it feels to be back to clear glass when you are done. It actually is making me do a better job keeping the whole bathroom tidy. After reading this, I decided I’d start using my squeegee after every shower. Much easier than using a steam cleaner! 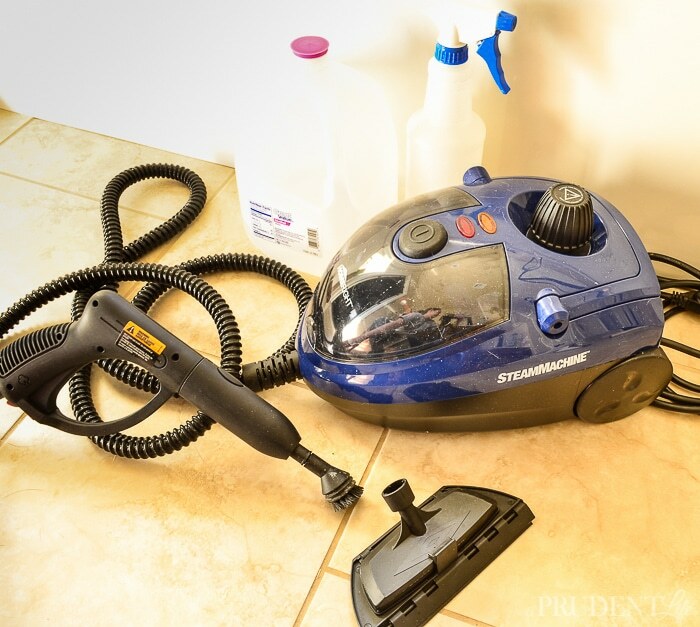 Oh my goodness I was JUST wondering the other day if I could tackle my tiles with our HomeRight Steam Cleaner and worried about using various chemicals in the machine. Now knowing that you just spray it down with vinegar will be such a lifesaver. Thanks for the super helpful post. Yeah! So glad it was helpful and timely for you! That is so helpful Rita, thank you for coming back to share with everyone!!! You’re welcome! I enjoy your posts and I have good friends in Jenks and Tulsa so I’m reminded of them when I hear from you. Great post! It is really nice that you don’t use any chemicals! I have a little steam floor mop with a few attachments so I’m going to give this a try. We move recently and I think the people who lived here before didn’t once even wipe the shower screen! Ugh – It’s hard when you inherit these issues too! I hope it works! Amazing tip. I love my steam machine. My sister gave me her old because she bought a new one. It works perfectly. At first I think I am not going to use it, now I use it everywhere. I am going to try in the bathroom, too. Thank you for sharing your article! Best regards! Oh yeah, and once you start using it, it’s hard to stop! I need a way to clean shower walls of rust stains from well water !!! I’ve never tried this, but we had some guys come door to door with a cleaner that they swore would take rust stains off our concrete driveway. Maybe something link this would work: http://amzn.to/1VwjA53 (Amazon affiliate link). Hi Melissa … Omgosh I can so relate. I was so close to really just trying to buy new glass shower doors! I tried everything just like you! Everything !!!! Then I found a cleaning service and they got it all clear after about 3 cleanings. Now they come every two weeks.. They still have not told me what their solution is… Obviously professional strength … But once I’m retired and have to do more cleaning myself I might invest in one of those steam cleaners… Love your info! I work too much and I’m 56 yrs old… Sooo I feel like I deserve professional cleaners.. I always cleaned myself ? Tried to clean my shower door per your recommendations. Does not and will not work. Spent multiple hours and all my hard water spots are still there. Total waste of money to buy a steam machine. Thanks….for nothing. I’m so sorry to hear that. Per the photos, it absolutely worked at our house or I never would have shared the post. Every town has different chemicals and water hardness levels, so my guess would be that you and I have different water. We use our steamer all around the house from de-wrinkling curtains and bedding to cleaning the microwave so I hope you’ll reconsider it’s value at your house. Or return it if you don’t believe it is of any value. No, they are absolutely the same shower. The white balance in the before photos is off, but I promise you it’s our same shower in every photo.